Whether you’re going to Mallorca or Malaysia, taking a first aid kit should definitely be on your list of essentials to pack. We often spend much more time outside when we’re on holiday or travelling than we do in our home countries and, as a result, injury can be more likely to occur. Just because you’re holidaying in France doesn’t mean that you can treat even minor injuries as you would at home. It may be easy to pop into your doctor’s surgery in the UK, but if you hurt yourself even in northern Europe, treatment can be expensive and time-consuming, even if you do have medical insurance. Something as simple as a paper cut can cause a huge amount of trouble if it’s not treated appropriately. If you don’t treat minor cuts with the right first aid supplies, you are drastically increasing your likelihood of infection and, if you’re trekking in the Borneo jungle, this could have nasty consequences! Without first aid equipment, you run the risk of allowing simple injuries to ruin your trip and will be missing vital medicines such as rehydrating tablets, painkillers and anti-histamines. You won’t know if there’s anything you’re allergic to in a new country if you haven’t been exposed to it before and with lots of new foods to try, anti-diarrhoea tablets are likely to come in handy. A simple infection can ruin your trip completely and getting into the habit of cleaning the smallest of cuts and applying antiseptic could be the difference between having the time of your life and going home early. A lot of infections can be prevented by good hygiene, regularly cleaned dressings and antiseptic; and by avoiding infection you can avoid seeing and paying for a doctor. 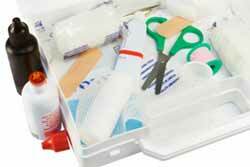 All first aid kits should, at the bare minimum, contain antiseptic and dressings. Getting a first aid kit that contains everything you could possibly need or just the essentials really depends on where you’re going, how long you’re going for and how you’re getting around. There’s no point in taking the biggest first aid kit you can buy if you’re backpacking, but there are essentials that each should contain. There are a variety of first aid kits available from pharmacies but they can often be found at more affordable prices online from medical supply companies such as BoundTree Medical. From small first aid kit pouches to large, comprehensive motorist kits – you can choose whichever is suited to you and your journey. Your doctor or travel clinic should be able to give you some advice on the contents of first aid kits if you require it, but mostly, it’s common sense. Keep clean and watch what you eat and drink – a decent first aid kit packed with essentials such as dressings and antiseptic will go a long way. Because each individual is different and requires different medicines, first aid kits won’t contain medicines other than antiseptics and eyewashes. When you stock up on medicines, it’s a good idea to fit them into your first aid kit so you, and anyone else, will know where they are in a hurry. Make sure they are clearly labelled and, if possible, in their original packaging. About The Author – Kitiara Pascoe blogs regularly about a range of topics including medical news. She is also an avid traveller who has injured herself in the wild on more than one occasion. This piece was researching by visiting several websites, including www.boundtree.co.uk.